The Nsyilxcen courses at the En'owkin Centre in the Okanagan Language Program are accredited with the Nicola Valley Institute of Technology (NVIT) with transfer to the Okanagan College (OC) and the University of British Columbia of the Okanagan (UBCO). Students who do not wish to take the courses for college/university accreditation purposes but for personal interest may apply for an En'owkin Centre Certificate upon completion of the program. Okanagan Language courses are an option within the College Readiness Program at En'owkin with accreditation from NVIT. NOTE: College Readiness is for adult learners who did not complete high school level academic skills before advancing to post-secondary levels of study. 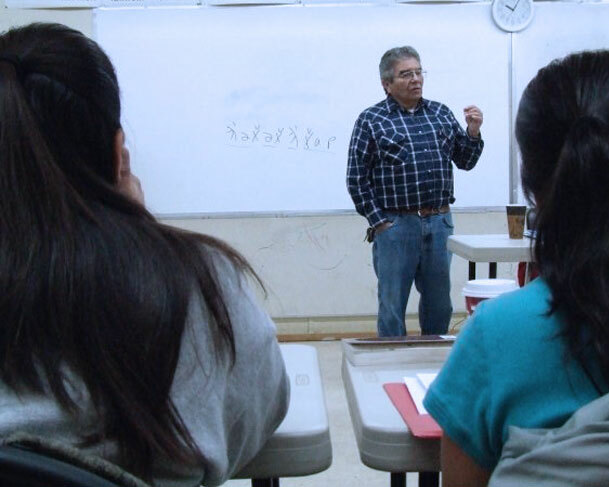 Sessions in the Okanagan Language Immersion Program are offered to registered En'owkin Centre students. Separate immersion program sessions are also available for families and interested community members and may be delivered in any of the Okanagan communities. Each year the students in the language programs incorporate n'syilxcen (Okanagan language) into their other programs of study by adding the language to their final projects as seen in these examples.